Wales prop Duncan Jones forms one half of one of the most recognisable front rows in world rugby alongside fellow "hair bear" Adam Jones. Jones is a mobile loose-head, with great ball carrying ability and good handling skills. He made his debut for Wales in 2001 as a replacement against Australia, and was a frequent member of the squad prior to the 2003 World Cup. Jones was selected for the tournament by Steve Hansen, and started all of Wales' pool games until he suffered a broken ankle against Italy. 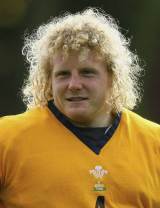 Following his rehabilitation from injury, Jones slotted back into the Wales setup in time for the 2004 Six Nations. He played in games with England, Italy and Scotland before being selected for Wales' two test summer tour of Argentina. Following the tour Jones played a full part in Wales' 2004 Autumn Internationals, but a dislocated thumb meant that he played no part in Wales' 2005 Grand Slam. He returned with some barnstorming displays during the 2005-06 season, and was rewarded with the captaincy for Wales' tour to Argentina in the summer of 2006. Having begun his career with Neath, Jones was now an important part of the fledgling Ospreys setup and was also installed as captain of the region for the 2006-07 season. Having regained his starting spot in the Wales team from the out of form Gethin Jenkins, Jones led his team to a Celtic League title in 2007. Following Wales' disappointing World Cup, Jones was selected by new coach Warren Gatland for the opening game of the 2008 Six Nations against England. Following a win at Twickenham Jones held onto his place for the game against Scotland, but was replaced by Jenkins for the remaining three games of the tournament. Jones won his fiftieth cap as a replacement in the Grand Slam decider against France at the Millennium Stadium before adding two more on Wales' summer tour to South Africa that year. He fractured a tarsal bone in his right foot in December 2009 and the injury failed to heal in spite of six weeks in plaster. He was subsequently forced to undergo surgery in February 2010 and battled back to fitness in time for the start of the 2010-11 Magners League season.